How do birdwatchers identify one species from another? First, they look carefully at the bird. What's the overall color? Is its bill long or short, thin or stout? What about its markings -- a ring around its eye or stripe on its head? What's your bird doing? Bird behavior can help you sort out one species from another. And where is your bird? What habitat? Red-winged Blackbirds, like the female seen here, are generally seen in marshy areas. Take notes, and you'll accumulate valuable knowledge to help you identify birds. 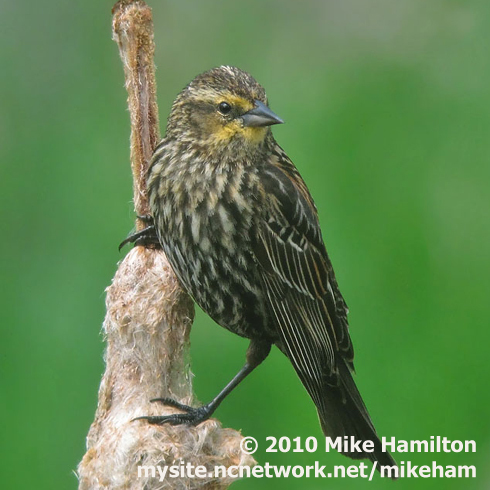 Want to learn more about Red-winged Blackbirds? Check out Cornell's All About Birds. Let’s eavesdrop on a group of birdwatchers exploring a freshwater marsh. What exactly do birdwatchers watch? How do they identify one species from another? Well, first, they look carefully at the bird. Don’t get caught up flipping through your field guide or app until you have a clear idea of what you’re looking for. What’s the overall color? Is its bill long or short, thin or stout? What about the bird’s markings -- like a ring around its eye or stripe on its head? What’s your bird doing? Bird behavior can help you sort out one species from another. And where is your bird? What habitat? Like fishermen who know how to “read the water,” it helps to know where to look. You learn what to expect. At a wetland full of cattails, for example, you’re likely to find a Red-winged Blackbird, singing from atop a stalk. This bird requires dense marsh vegetation for its nest. By taking notes, you’ll accumulate valuable knowledge to help you identify birds. Then of course, there are those that are always going to be really hard to see. That’s what makes it so exciting when you finally spot a bird like the elusive Virginia Rail. Bird sounds of featured birds provided by The Macaulay Library of Natural Sounds at the Cornell Lab of Ornithology, Ithaca, New York. Song of the Red-winged Blackbird recorded by W.W. H. Gunn; Virginia Rail by W.L. Hershberger. Soundtrack of the birdwatchers at the wetland recorded by C.Peterson.